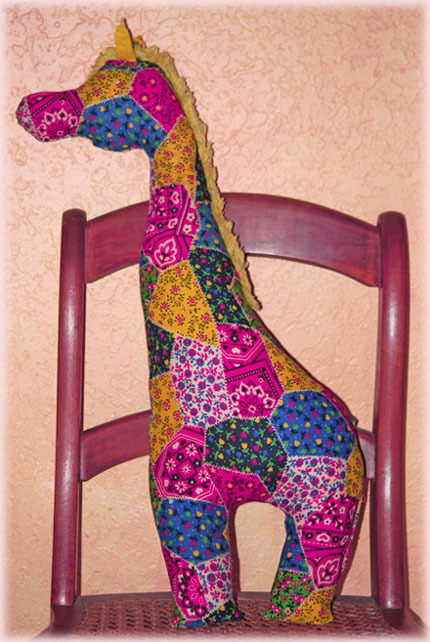 When I got all the old stuffed animals from the attic last fall one that I put aside to do something with was a patchwork fabric giraffe. 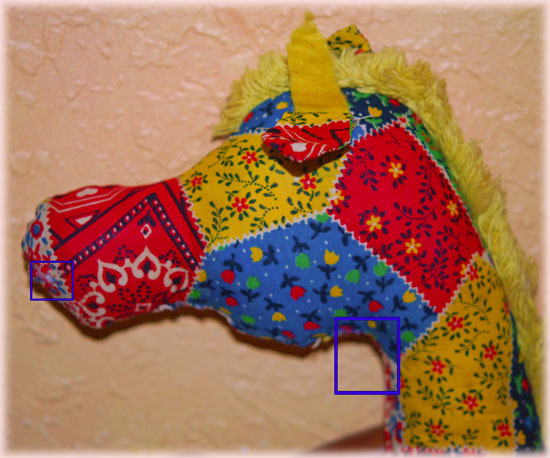 He had several small holes along the seams and one very large rip at the neck that looked like a dog had tried to take his head off. In addition he was filled with chopped foam, and after at least 30 years I didn’t feel good about that at all. I don’t know about you, but sometimes if I’m afraid something will turn out badly I put it aside to think about it later. You know, like Scarlett O’Hara, I’ll think about it tomorrow. Well, finally, tomorrow had come. Amazingly, other than the actual washing and drying, the project didn’t take much more than an hour. Why did I put it off? Let me think. Worst case scenarios. I started taking out the chopped foam and horrible creatures crawled out? REALLY? Hey, if that happened I would grab my camera and start taking photos, that wouldn’t exactly be a BAD thing. Worst case scenario really would have been he didn’t survive washing. But that was going to happen if it was going to happen. Waiting didn’t make that any less likely. And the sooner I found out, the sooner I would know. I opened the neck seam with the already big hole a bit larger and dumped all of the very old dried out foam into the trash, turning him inside out as I went. I had to scrape him out as the foam tends to stick to the inside. Then, into the washer on delicate cycle and I held my breath. But, he came through with flying colors. I went ahead and put him into the dryer on low to get a head start on drying, and finished drying overnight hanging over the shower door. When I turned him right side he looked fine. He seemed none the worse for wear, and I wish I had thought to take a photo, but I didn’t. I did find a little puncture in his nose, which supports my dog at the throat theory and so my first order of business was to patch that. It was big enough to get your pinkie finger in and I knew it would do nothing but get bigger. I simply put a patch with white muslin on the inside, and then stitched it to reinforce. 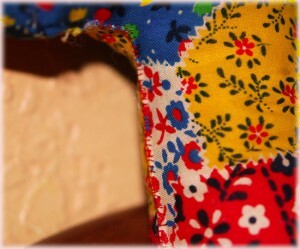 It doesn’t really show unless you look hard because the fabric is patchwork looking anyway. I could have repaired the small places where the seams had come unstitched by machine but I decided not to bother and just hand stitched them (from the inside). The hard part was his neck. There was clearly some fabric missing. It was like surgery and I had nothing to do a graft with. So, his neck will forever be a little skinnier at the top. It’s like he got a little jowl lift! BTW it’s Handmade Monday again! Let’s all run over and check it out. Well, actually, it’s so much easier than running, we can just click on the link above and don’t even have to get out of our chair! Let’s go! He’s lovely and colourful. I know what you mean about washing old fabric, I worry that the moths have been at it and it would disintegrate. Oh ! fantastic, love all these colors ! Superb my friend, congrats ! I know what you mean about putting things off and then wondering why you’ve put it off as it was a quick and easy job. I love that he got a jowl lift – if only I could have one so easily 😉 He’s a lovely giraffe and it’s great that he got a new lease of life. Well done on giving him a new lease of life. I bet he will be as loved now as he was all those years ago. Oh, I would love my neck to be a little skinnier at the top[ (and everywhere else). He is lovely, lots of gorgeous colours. Hope you have a good week. You’ve done a really good job on this. Love the bright colours.